DOP or PDO (Protected Designation of Origin): This is a designation given to agricultural products or foodstuffs whose production, preparation and processing occur in a given geographical area and whose quality or other characteristics are essentially linked to this area. IGP or PGI (Protected Geographical indication): is a designation given to agricultural products or foodstuffs whose production, preparation or processing occur in a given geographical area and whose quality, reputation or other characteristics can be attributed to its geographic origin (including natural and human aspects). Monte Amiata chestnut – Castagna del Monte Amiata IGP (Monte Amiata): a sweet, delicate chestnut from the volcanic soils of the Amiata. The nuts, either boiled or roasted, marry perfectly with sweet muscat wines, gelato and custards. The chestnuts can be dried and ground for flour to make Castagnaccio and chestnut polenta. Garfagnana chestnut flour – Farina di neccio della Garfagnana DOP (Garfagnana - Lucca): the cultivation of chestnuts trees for their nuts goes back to around 1000 CE . In the area around Garfagnana a cultivar was created which is especially suited to the production of flour and chestnuts. The chestnut tree is therefore locally known as the ‘bread tree’ and its fruits, the chestnuts, as ‘tree bread’. Lunigiana chestnut flour – Farina di castagna della Lunigiana DOP (Lunigiana - Massa Carrara): the chestnut flour from Lunigiana has a very fine texture and an ivory in colour. Traditional products made in Lunigiana from chestnut flour are bread (marocca), focaccine (cian) and the "lasagne " (lasagna bastarda). Mugello chestnut - Marrone del Mugello IGP (Mugello - Firenze): the IGP Mugello sweet chestnut is markedly sweet, it peels easily and it is not excessively floury or astringent. It boasts slight hints of vanilla flavor and smell like hazelnuts or fresh bread. Caprese Michelangelo chestnut – Marrone di Caprese Michelangelo DOP (Caprese Michelangelo - Arezzo): You can recognize this traditional ‘marrone’ thanks to its elliptical shape, unique scent and sweet taste. Precisely because of its characteristics, it is excellent when roasted, glazed, peeled or boiled with fennel. San Gimignano saffron – Zafferano di San Gimignano DOP (San Gimignano - Siena): the saffron of San Gimignano is extremely pure. It's cultivated according to organic methods. 150.000 flowers give 1kg of saffron. Siena Ricciarelli – Ricciarelli di Siena IGP (Siena area): ricciarelli are white, soft, moist and extremely sweet boat-shaped almond pastries covered with white icing sugar. Siena Panforte – Panforte di Siena IGP (Siena area): panforte is a traditional Christmas fruitcake, low and compact, and made from honey, nuts, almonds, hazelnuts, spices and candied fruit and covered with icing sugar. Tuscan cantucci - Cantucci Toscani IGP (throughout the region): cantucci are very popular oblong-shaped crunchy biscuits from Tuscany. They’re made with with flour, eggs, butter, sugar honey and almonds and served as dessert with a glass of Vinsanto. Pecorino Romano cheese DOP (Grosseto area): it’s a hard cheese, made out of sheep milk derived exclusively from farms in the area of production (Lazio, Sardinia and Tuscany). Pecorino Toscano cheese DOP (throughout the region): the cheese is prepared with full cream, pasteurized ewe's milk, often by farm-based cheese producers. It is generally regarded as a hard cheese, frequently used for grating, and to achieve this characteristic hard texture, the cheese should be left alone for at least four months. It’s produced in Lazio, Toscana and Umbria. Mortadella Bologna IGP (throughout the region): it is a pure pork cooked sausage, cylindrical or oval with pink color and intense aroma, slightly spicy. It’s produced in Emilia Romagna, Piemonte, Veneto, Tuscany, Trento, Marche, Lazio and Lombardy. Tuscan Ham - Prosciutto Toscano DOP (throughout the region): Tuscan ham is made only with pigs that are born, bred, fattened and slaughtered in Tuscany and in other regions in north an central Italy. Colonnata lard – Lardo di Colonnata IGP (Colonnata, Massa Carrara): this fine salami is made from pork lard that is cured in local Carrara marble quarries and caves. Layers of lard are alternated with pepper, salt, sage and rosemary. Small Italian salamis ‘alla cacciatora’ (hunter style) - Salamini italiani alla cacciatora DOP (throughout the region): different types of small salamis are produced all over Tuscany and throughout central and northern Italy. They are known as ‘cacciatori’ or ‘cacciatorini’ and are usually dry, compact and ruby red in colour. 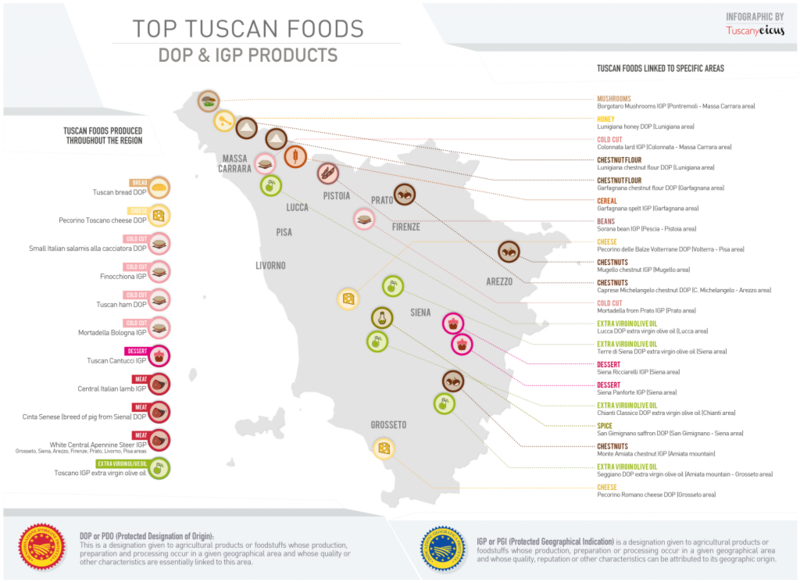 Toscano IGP Extra virgin olive oil (throughout the region): Tuscan extra virgin olive oil with a protected geographic origin binds the whole production in the Tuscan Region, starting from the growing of the olives to the extraction of the oil, including its packaging. Chianti Classico DOP Extra virgin olive oil (Chianti area): the production area corresponds to the area delimited for Chianti Classico wine production and covers numerous municipalities in the Siena and Florence provinces. As for the organoleptic evaluation, the oil must range from deep green to green with golden nuances and have a fruity aroma and a bitter, slight pungent flavor. Terre di Siena DOP Extra virgin olive oil (Siena area): olives must be produced in the hilly territories of the province of Siena dedicated to oil production. Color must range from green to yellow, with color variations with the passing of time. The taste has some bitter and pungent notes. Lucca DOP Extra virgin olive oil (Lucca area): this olive oil is produced in a defined geographical district of the province of Lucca. It has a fruity, basically sweet olive taste from light to medium and with pungent, bitter sensations. Seggiano DOP Extra virgin olive oil (Monte Amiata): it’s exclusively obtained from olive groves that have at least 85% of the Olivastra Seggianese cultivar. The product features have the following organoleptic characteristics: color from green to gold fresh, net olive odor; flavor: clean with herbaceous notes. Garfagnana spelt – Farro della Garfagnana IGP (Garfagnana area): perfect and healthy for all your summer salads and winter soups! Farro, or spelt, is a truly ancient grain. It was a favourite dish of the Romans who used it to feed their legions. Nowadays, in a particular area of Tuscany called Garfagnana it is still widely produced and eaten. Sorana bean IGP Sorana beans – Fagiolo di Sorana IGP (Sorana - Pistoia area): pearly, small, thin-skinned (Piatellino) or bigger and red (Antico Rosso) tasty and easy to digest, it is cultivated in the hills of Pescia (Pistoia), where farmers in the area have passed down seeds from generation to generation. Borgotaro mushrooms – Fungo Borgottaro IGP (Pontremoli - Massa Carrara area) Borgotaro mushrooms are grown between Borgotaro and Albareto in the province of Parma and Pontremoli in the province of Massa Carrara. Lunigian Honey – Miele della Lunigiana DOP (Lunigiana area): the honey of Lunigiana was the first in Italy to obtain DOP status from the European Union. The DOP classification for Lunigiana honey is reserved for two types: acacia honey and chestnut honey. Tuscan bread - Pane Toscano DOP (throughout the region): Tuscan bread is commonly 5-12 cm high and weighs from between 900 g to 2 kilos. It’s made using starter, water and wheat flour mixed together. Rectangular or rhomboidal, its crust is reddish-brown, the dough is soft and the flavor is strictly bland because of the complete lack of salt. Cinta Senese (breed of pig from Siena) DOP (throughout the region): This particular breed of pig is characterized by a dark coat and the belt (cinta) of light hair that wraps around the center of their body. The Cinta Senese is produced throughout the region. White Central Apennine Steer - Vitellone Bianco dell’Appennino Centrale IGP (Grosseto, Siena, Arezzo, Firenze, Prato, Livorno, Pisa): the name (Vitellone Bianco) is used to refer to three breeds of cattle: Chianina, Marchigiana and Romagnola that are highly similar and are bred in the same area. The cattle are raised in the traditional way. They are never raised on large ranches but only on small farms where cattle are an integral part of the farm resources. Central Italian Lamb – Agnello del Centro Italia IGP (throughout the region): IGP lambs are breastfeeding until weaning and further food consists in hay from the area. They’re slaughtered after 50 to 130 days from birth. The production territory includes Emilia Romagna, Tuscany, Marche, Umbria, Lazio and Abruzzo.